This is part of a sponsored collaboration with National Pork Board. However, all opinions expressed are my own. It’s the most wonderful time of the year – at least that’s how I feel as soon as the chilly temperatures start to roll in and the trees begin to shed their leaves. The cooler weather signifies the beginning of the holiday season and nothing makes me more excited than the thought of all things festive. Being a self proclaimed foodie means I’ve already started thumbing through magazines and books for meal ideas. I’m always looking for new and innovative ideas which doesn’t require a ton of time in the kitchen but also cost effective. 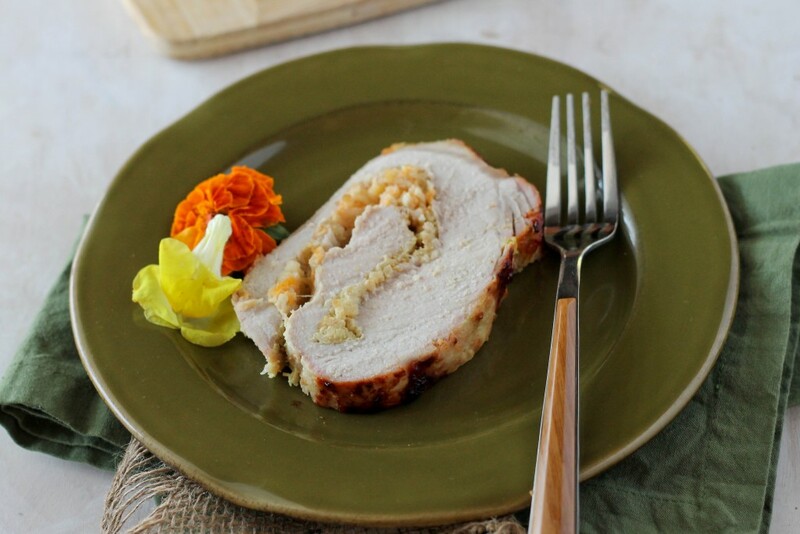 This 5 ingredient Roast Pork Loin with an Apple Cheddar Stuffing is not only impressive but it’s super easy, versatile and budget friendly and not to mention delicious. I popped into Kroger and picked up a 5 lb pork loin which happened to be marked down to just under $9 and the bonus is that it’s large enough to feed a small crowd. I tend to skip the traditional main holiday dishes and just simply make dishes that I enjoy and pork is a great addition to any table as its incredible versatile. 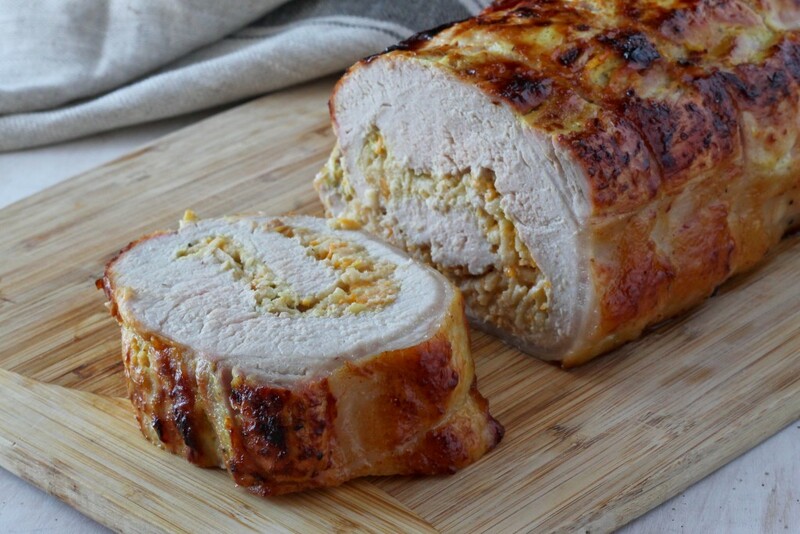 I used Dijon mustard dressing to marinate the pork loin overnight and it soaked up the flavor – each bite had the wonderful flavor that wasn’t overpowering and complemented the apple cheddar stuffing well. 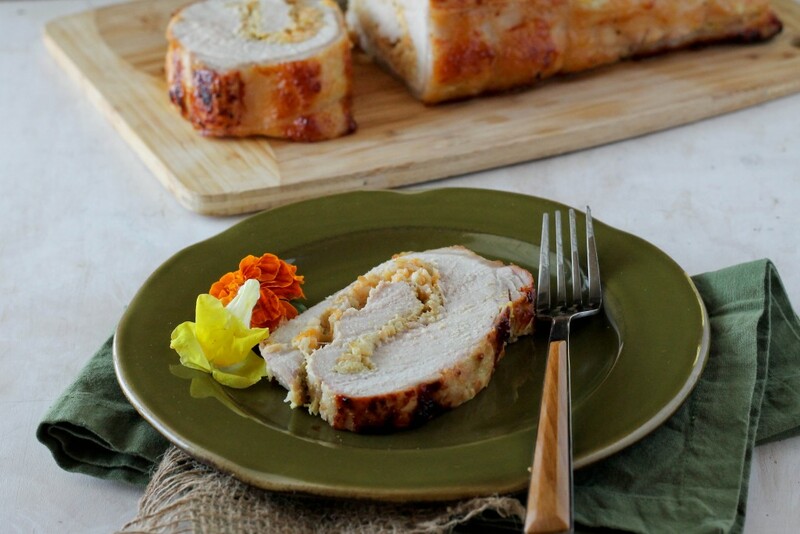 The apple cheddar stuffing is not only tasty but makes this tender pork loin moist. Its super simple so you will be spending less time in the kitchen and more time creating memories with loved ones. For more pork recipes and ideas head to Pork Be Inspired. Butterfly the pork loin by making an incision in one end and slicing it through the middle but do not cut through the other end. Spread open and pound flat with a meat mallet or rolling pin. Place pork loin in a bowl and pour Dijon mustard dressing over it making sure to coat both sides. Place in a refrigerator for at least 6 hours, preferably overnight. Preheat oven to 400 degrees. Remove pork from fridge and allow it to come to room temperature while you prepare the stuffing. In a bowl mix grated apple, panko bread crumbs and grated cheddar cheese. Place the pork on a cutting board and spread an even layer of the stuffing on the inside of the pork loin then roll tightly to create a log. Tie with butchers twine or use tooth picks to secure the loose end. Place on a baking sheet and into preheated oven. Roast for 1 hour and 15 minutes or until the internal temperature reads 140 degrees on a meat thermometer. Remove from oven and allow to cool before removing the butcher’s twine or tooth picks then serve.